1. Ski Slopes Near Cabin Mountain, Tucker County. W. Va. 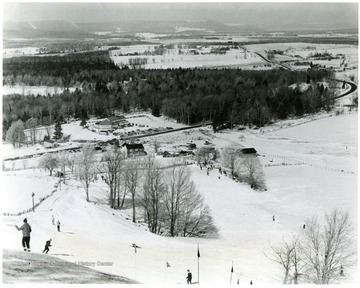 Ski Slopes Near Cabin Mountain, Tucker County. W. Va.
2. 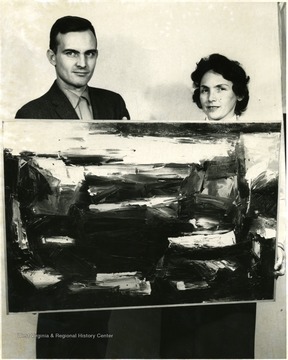 Local Painting, Morgantown, W. Va.
Local Painting, Morgantown, W. Va.
A man and woman hold an abstract painting. 3. 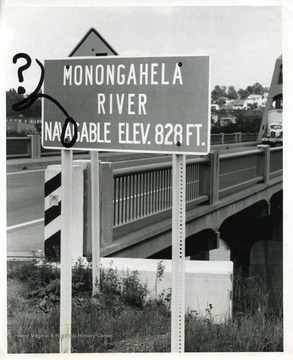 Misspelled Sign on Star City Bridge, Morgantown, W. Va.
Misspelled Sign on Star City Bridge, Morgantown, W. Va.
Misspelled sign by the Star City Bridge should have read: Monongahela River Navigable elevation 828 feet. The word navigable is misspelled. 4. 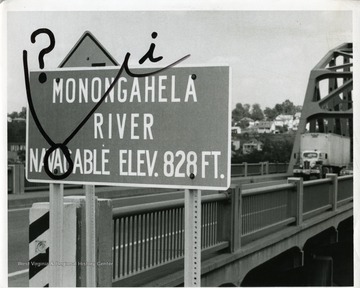 Misspelled Sign on Star City Bridge, Morgantown, W. Va.
5. 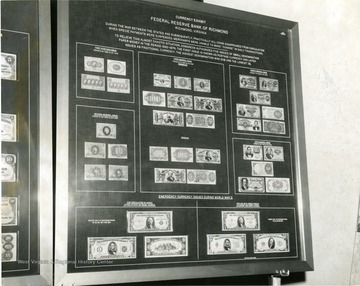 Currency Exhibit in Lobby of First National Bank, Morgantown, W. Va.
Currency Exhibit in Lobby of First National Bank, Morgantown, W. Va.
Currency Exhibit from the Federal Reserve Bank of Richmond, Richmond Virginia, located in the Morgantown, W. Va., First National Bank. 6. 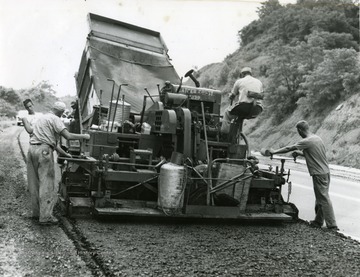 Paving Monongahela Boulevard, Morgantown, W. Va.
7. 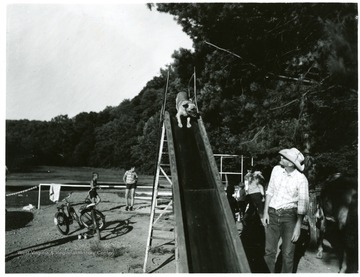 Dog Going Down a Slide at the Sabraton Playground in Morgantown, W. Va.
Dog Going Down a Slide at the Sabraton Playground in Morgantown, W. Va.
8. Project 63 Construction on High Street, Morgantown, W. Va.
Project 63 Construction on High Street, Morgantown, W. Va.
Workers seen running a light fixture on a building located on High Street in Morgantown, W. Va.
9. Planting Trees, Morgantown, W. Va. 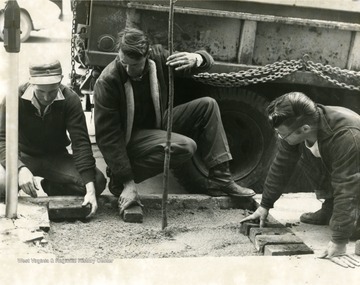 Planting Trees, Morgantown, W. Va.
One member of the group is 'Donald Hayhurst'. 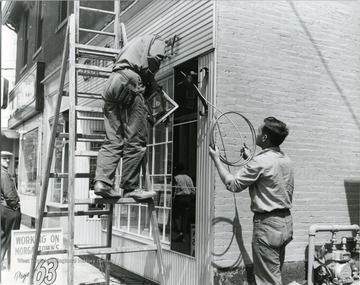 They can be seen planting a tree along the road in Morgantown, W. Va.
10. 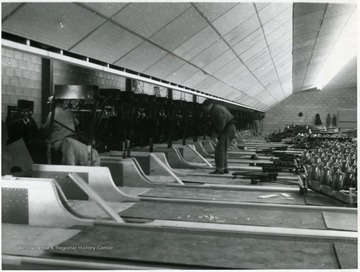 Construction of a Bowling Alley in Morgantown, W. Va.
Construction of a Bowling Alley in Morgantown, W. Va.
11. 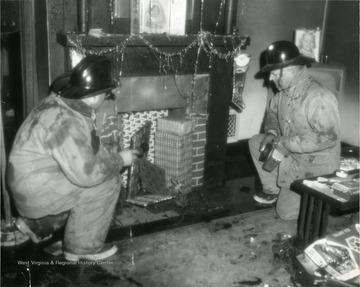 House Fire, Morgantown, W. Va.
House Fire, Morgantown, W. Va.
'Firemen in a residence extinguishing a fire'. Decorations imply it was Christmas time at the time of fire. 12. 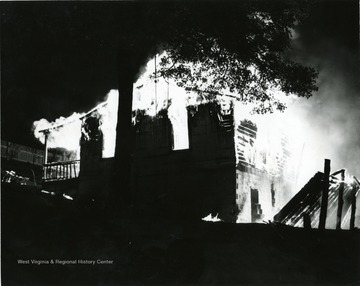 Fire in Morgantown, W. Va.
Fire in Morgantown, W. Va.
Building in Morgantown, W. Va., engulfed in flames. Parts of the building have fallen to the ground and are still ignited.